Today, Uzbekistan is remaining one of the repressive countries in the region that maintains a tight grip on mass media. Despite it has all the nominal guarantees of the freedom of speech, the media is being systematically attacked by the government. The article 5 in the law of the Republic of Uzbekistan on mass media [ru] states that mass media in the country are free and can act freely according the laws of the country. In the same law, the article 7 states that there is no censorship in the country and “no one has a right to demand the preliminary approval of the publishing materials, and change or take them off from publication (broadcasting).” However, we witness de facto contradicting de jure in Uzbekistan. The blogosphere of Uzbekistan today is discussing the action to fight with internet censorship in Uzbekistan. The open-ended action was organized by the Information Agency Fergana.ru, Uznews.net and a blog Civil Society in Uzbekistan. The organizers state that the ban on independent and unbiased information became total following the Andijon events in 2005, and today several hundreds of websites are made not accessible via state controlled internet providers. Blog “Civic Society in Uzbekistan” urges all blocked websites to join the action. 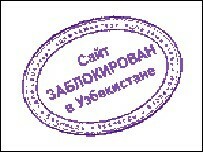 “As part of the campaign,” they write, “websites that cannot be accessed in Uzbekistan are encouraged to post, on their main pages, an emblem stating they have been banned, fully or partially, in Uzbekistan” [ru]. BBC Uzbek Service cites the organizers stating that the open-ended action will last until the government of Uzbekistan takes positive steps in improving the state of media and abolishing the censorship in the country [uz]. A blog Though the Eyes of Uzbekistani writes that one of the reasons for them to join the action against censorship is that they are blocked in Uzbekistan, and the blog’s authors cannot directly update the blog. Unfortunately, the blocking of websites and Information resources is continuing in Uzbekistan. Our blog is also blocked in the country. For us, authors, it is really difficult to update the blog in Uzbekistan. Our friends outside of Uzbekistan are helping in overcoming this problem, as today, even proxy servers are not of use, especially when it comes to posting different attachments and photographs. I had a chance to interview one of the authors of the blog Though the Eyes of Uzbekistani about the action to fight internet censorship. He seems to be pessimistic about the goals of the action, as he believes that they are not going to change the situation a lot, if at all. “The action will fail, as the main target group – Uzbekistani population – does not have access to it. It will become another try to draw international community's attention to the problems in Uzbekistan, and nothing more. However, we must try,” he says. However there not many websites joined the action, the organizers are optimistic saying that it will attract more attention soon, as the action has just begun. The other popular blogs that are blocked in Uzbekistan are neweurasia (blocked in June 2006), Registan (blocked in March 2007), Global Voices Online, and opposition blogs Turonzamin and Yangidunyo.